Monet first visited Italy’s southern coast with Renoir in December 1883. Shortly thereafter, he returned alone to paint, writing his dealer that working "à deux" was constraining. 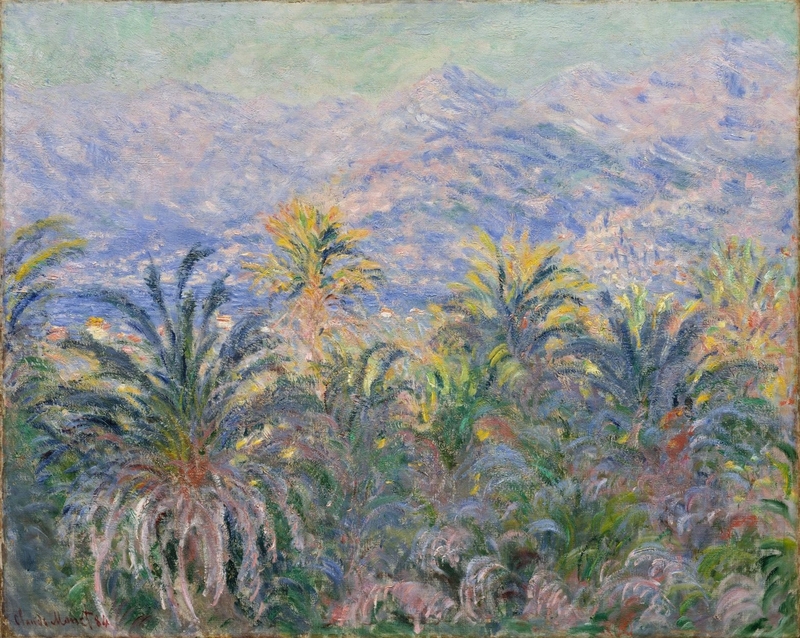 This scene and The Valley of the Nervia reflect Monet’s excitement at the new motifs offered by the region’s palm trees and mountains. For this view, he ventured from his hotel in Bordighera and looked across the Bay of Ventimiglia toward the Alps on the French border. Monet visitò per la prima volta la costa meridionale dell'Italia con Renoir nel dicembre del 1883. Poco dopo tornò da solo a dipingere, scrivendo al suo commerciante che lavorare "à deux" era vincolante. Questa scena e The Valley of the Nervia riflettono l'eccitazione di Monet per i nuovi motivi offerti dalle palme e dalle montagne della regione. Per questa visione, si avventurò dal suo albergo a Bordighera e guardò attraverso la baia di Ventimiglia verso le Alpi al confine con la Francia.